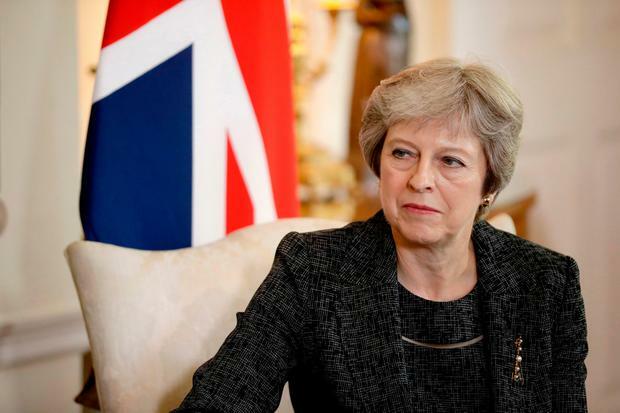 British Prime Minister Theresa May stands accused of surrender by elements of her own party over a Brexit deal that ensures there will not be a hard Border in Ireland. The agreement reached between Britain and EU negotiators includes a so-called ‘backstop’ which will keep Northern Ireland tightly locked to European trade rules “unless and until” another means of frictionless trade is found. However, the Government remains extremely nervous that Mrs May will not be able to win enough votes for the proposal in Westminster. In a strong indication the DUP will vote against the deal, party leader Arlene Foster said they would oppose “a deal which weakens the Union”. Taoiseach Leo Varadkar ordered an effective media blackout from his ministers on the deal. Sources said the Government is “content” with the package. The Irish Independent understands the British side “categorically conceded” it will not be able to leave the arrangement without EU approval. But as Mrs May sought support from her cabinet, opponents said Britain was being turned into a “vassal state”. Brexiteer former foreign secretary Boris Johnson and Conservative MP Jacob Rees-Mogg claimed Dublin will now have more influence over Northern Ireland than London. Mr Johnson said: "We will not have protected our precious union. For the first time since partition, Dublin would have more say in some aspects of the government of Northern Ireland than London." Mr Rees-Mogg claimed: "White flags have gone up all over Whitehall. It is a betrayal of the union." All eyes will now turn to the Democratic Unionist Party (DUP), whose 10 MPs prop up Mrs May's minority government. In a strong indication that the DUP will vote against the deal, party leader Arlene Foster said that without an exit clause the UK "would be handcuffed to the European Union with Brussels holding the keys". She said the DUP would oppose "a deal which weakens the union". Ms Foster said it would be "democratically unacceptable for Northern Ireland trade rules to be set by Brussels". Under the agreed text, the whole of the UK will enter a temporary customs arrangement. However, at its "core" will be specific provisions for Northern Ireland which will keep the region more tightly aligned to the rules of the EU single market. It is understood a review of UK-EU relations will take place six months before the end of the transition period in December 2020. This will determine whether the UK is ready to move to a free trade deal, transfer to the backstop or extend the transition. In the Dáil yesterday, Mr Varadkar said the language around the customs arrangement was not important so long as the Irish objectives were achieved. "Whether it is a double backstop, a backstop to a backstop or a hybrid backstop is not the point. The point is having a legally binding guarantee that a hard Border would not emerge between Northern Ireland and Ireland," he said. Defending his acceptance of a review mechanism, Mr Varadkar noted that the Good Friday Agreement has one. "Part of the understanding behind the Good Friday Agreement was that if one wanted it to be long-standing and enduring, it made sense to build into it review mechanisms. "If we are going to have an agreement between the UK and the EU, one has to be willing to be generous on occasion and give them something, so long as one maintains one's objectives and outcomes," he said. A string of diplomatic meetings are now being lined up to take place if Mrs May survives her cabinet meeting at 2pm today. A meeting of the Irish Cabinet has been called for 9.30am "to consider developments". Mr Varadkar's spokesman said last night: "The Irish Government wants to allow the British government to have time and space to consider the draft agreements." EU ambassadors are also expected to be talked through the plan by chief negotiator Michel Barnier in Brussels this evening. At that point they will begin planning for a special summit of EU leaders on Sunday, November 25. Sources told the Irish Independent that this is a "best-case scenario, but everything depends on how it goes down in London". The reaction from other EU capitals is also being closely watched by Irish and EU officials. There are concerns that allowing the UK to remain in a customs arrangement could give them an unfair trading advantage unless they stick by EU environmental, labour and State aid rules. Irish sources are confident the solidarity shown by the EU27 since the referendum in June 2016 will be maintained. In a bid to get her cabinet on side, Mrs May will warn that many of the UK's contingencies for a 'no-deal' Brexit will have to kick-in on December 1 if the Withdrawal Agreement is rejected. "Cabinet will have to decide within the next few weeks whether no-deal is to be its main planning scenario for exit," a UK official said. Then to get a deal through the UK parliament, the prime minister needs the votes of about 320 out of 650 MPs. She will turn to the Labour Party in the hope that some opposition MPs will back her position rather than see the country crash out of the EU. Officially, Jeremy Corybn's party has said it will oppose any agreement that does not retain "the exact same" economic benefits that it now has with the EU. Amid the flurry of activity yesterday, the EU Commission published details of its plans for a no-deal scenario. It noted that Brexit will affect members "to varying degrees, but none more so than Ireland". "The Commission stands ready to support Ireland to find solutions addressing the particular challenges," it said.